School Pictures. Thanks, but no thanks. Today is picture day for our Little Guy. The second school picture day of the year (third if you count the class picture), and we're not buying any. We bought one sheet - the smallest amount you could buy, which was like, $15 for the first school picture this year, and to tell the truth I didn't even really want to buy that. Then we bought the class photo ($12, I think), and now we're completely skipping over today's pics. But! They get to wear their own clothes! You'll look like you don't care about your kid. In my opinion, we were foolish to buy the first picture because we've preordered our yearbook ($20) and his photo is going to be in that. Why on earth would I buy cheesy, school photos, that will most likely contain the head and shoulders of my adorable boy who's face will probably be grimacing (because that's what they do at this age instead of smiling), when I could take a ton of shots with my own camera - heck, even my phone for that matter! You can buy the school photos and snail mail them to your family members so that they can stick them in a drawer or box to pull out one day 40 years from now when they're feeling nostalgic. OR you could just take a great photo yourself, upload it to facebook, and let everyone who wants a hard copy (does anyone really want a hard copy?) right click and save it. Yes, there is an option to buy the digital image of the photo (the cheesy, not pre-approved photo) but it's an add on to a picture package for like $40!! Umm... thanks, but no thanks. For now, I think I'll just take my own pictures of this kid and his hilarious personality. hahaha those last photos of him had me laughing so hard. He is going to be quite the charmer! I'm 100% with you on this one. 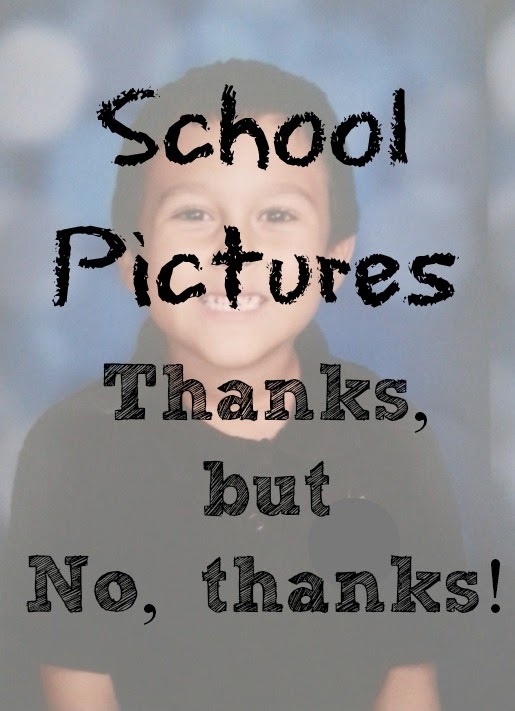 I've never purchased school pictures. They just are not a good representation of my son's personality. I'd rather have photos of him that make me remember family moments. Glad to know I'm not the only one!